In its seemingly never-ending quest for uniformity, the industry is taking steps to move closer to standard quality measures. The establishment of recognized quality standards has taken on greater urgency in light of the expected acceleration of HIT adoption in the wake of the HITECH Act. The real concern is that widespread adoption of electronic medical records (EMRs) will fall short of the goal of higher quality, cost-effective healthcare without established standards to ensure that patient encounter data are captured accurately and in a manner that facilitates efficient exchange of health information. But the heightened awareness of the need for established quality standards is driven by more than just greater prevalence of technology. It is also the result of the changing role of transcription within the greater HIM picture. Transcription is no longer a stand-alone function but rather one of many contributors of information into an EMR. Established standards are critical if all parties expect to work harmoniously to the benefit of the end user. Perhaps the greatest issue confronting the transcription industry in terms of established standards is the lack of a cohesive voice to govern a confusing array of input sources. Without an established set of standards, quality measures are typically decided one on one between the client facility and transcription service. But the issue is often not whether a document has been accurately transcribed but the definition of accuracy according to the end users. In the traditional sense, medical transcription is converting dictated notes into a text-based document. But its simplicity is deceptive when end-user expectations come into play. For example, some physicians want the document to reflect exactly what they’ve dictated, while others expect it to reflect their meaning. That often requires the medical transcriptionist (MT) to correct grammar, fill in gaps, and format according to facility requirements. In both cases, the end result may be a document that is considered inaccurate by the end user. For example, best practices established by the Association for Healthcare Documentation Integrity (AHDI) call for accuracy scores quantified with the use of a numeric calculation that weighs varying degrees of error against the length of the report. The AHDI recommends 100% accuracy related to critical errors, 98% accuracy for major errors, and 98% accuracy for all errors in the report, including minor errors. While the AHDI does provide definitions of minor vs. major errors, much is still left to individual interpretation. When speech recognition software enters the picture, it becomes even less clear. The accuracy levels are often dictated by the software creators and the individuals using the program. The client, working with the technology vendor, will typically set the threshold that determines which dictations can be managed utilizing the software and which will require regular transcription. The emergence of speech recognition software isn’t the only change in the evolving medical transcription industry that has served to muddy the waters in terms of measuring quality. Outsourcing, both onshore and offshore, has added a layer of complexity by increasing the number of touch points before a document is seen by the client facility. With the transcription process being managed largely by a widely disbursed workforce, including documentation specialists working remotely from their homes and even overseas, it is not uncommon for each document to go through multiple reviews before it reaches the client facility. According to Judy Hinickle, president of TransCom Corporation, a medical transcription and consulting company, to accurately evaluate the quality of a transcribed document, it is critical that all transcription methods be judged based on the same criteria. This includes traditional dictation, speech recognition, handwriting recognition, structured text, interactive direct entry, and natural and intelligent language processing. The evaluation, she notes, should be based on review criteria for the accurate presentation of any elements of patient safety, document integrity, or style in the documentation of the patient encounter. Hinickle notes that quality expectations are often tied to the reviewer’s bias. For example, a QA reviewer may hold contractors to far higher standards than in-house staff. Also, there is often no review of the work directly input into the record by a physician or by various software or hardware technologies. She also notes that speech recognition vendors will often create their own quality standards relative to the number of words or phrases correctly translated, as opposed to the magnitude of the error. “While technology contributes to the production of medical documentation, highly trained professionals exercising critical thinking skills and informed interpretive judgment are best suited to ensure quality in the production of medical records,” says Hinickle. Because of the rapidly evolving nature of medical transcription, many consider the best practices from the AHDI to be too dated to do an adequate job in today’s healthcare environment. As a result, there is a growing demand from the industry for a standard set of quality measures against which all sources of transcription will be evaluated. But the problem remains that the transcription industry is one in which commonly accepted definitions are few and far between. To that end, the AHDI and the Medical Transcription Industry Association (MTIA) assembled a Quality Assurance Best Practices workgroup that has spent the past two years identifying metrics and definitions for a credible, measurable QA program standard for medical transcription. During the April MTIA Quality Assurance Summit, the committee released its draft paper, “Metrics for Measuring Quality in Medical Transcription,” for comment. According to Kivi, a steering committee member of the QA workgroup, the final result will be an enhancement of existing AHDI best practices that will address the broader scope of the healthcare documentation process and how quality is measured and managed, from voice capture through the final distribution of the medical report, whether generated through traditional transcription, speech recognition, or an automated system. In addition to input from MTs and QA specialists, the draft paper also incorporates recommendations from the AHIMA and medical transcription service organizations (MTSOs), as well as academic and industry statisticians, to ensure every possible variable is taken into consideration. By inviting the AHIMA and MTSOs to participate in the standard-setting process, the hope is that the final program is comprehensive enough to meet the changing needs of today’s technology-driven healthcare environment and the end users. Kivi notes that end user input is particularly important as they—physicians, coders, and researchers—are the ones who judge document quality based on the availability and usefulness for their respective responsibilities and needs. Those diverse expectations go beyond the traditional role of the medical transcriptionists who have been charged with converting dictation to an electronic record and embrace the industry’s future where medical language specialists ensure the integrity of health data for all end users. 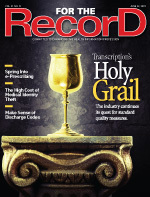 Differing expectations along with variables over which documentation specialists have little control, such as workflow routing of the transcribed document, accuracy of admission/discharge/transfer information, and performance of technology and/or software such as speech recognition, are part of the reason why the transcription industry has wrestled with quality standards over the years. The struggle has become more acute since the industry moved away from the majority of the work being done in house through traditional transcription. This evolution has made it “easier to agree upon the general categories of errors within the industry than it has been to agree upon a formula for use or the appropriate sampling techniques or whether technological document originators need to abide by the same standards as medical transcriptionists,” says Hinickle, past chair of the QA workgroup. One unfortunate side effect of outsourcing the majority of transcription has been the loss of feedback to both documentation specialists and facilities that serves to improve the quality of the overall process. Retrospective audits are a valuable but largely underutilized tool in the transcription industry. They can reveal areas of weakness, both in the overall process and with individual transcriptionists or software applications. SPi Healthcare, which provides onshore and offshore medical transcription solutions, conducts monthly retrospective audits and reviews the findings with both its internal transcription and operation teams and its clients. In addition to validating the quality of the services SPi provides to its clients, audits also help the facilities identify areas for improvement, such as problematic physicians or dictation policies that hinder the accuracy of final reports. “We make sure that we audit every person that distributes a report to a client, whether they be an MT [medical transcriptionist] or a QA [quality assurance] editor. If they distribute one or 100 reports to a client, we make sure we touch every one of them,” says Christabel Campos, SPi’s director of audit and compliance. When conducting its audits, SPi works with the version of the report that is received by the client to ensure it is evaluating the exact document the client would receive. That eliminates the potential that it will be working with a document that has been altered by the client for any reason. Audits are conducted utilizing the original voice record and evaluated using the same scoring methodologies as the company’s QA editors use when conducting concurrent evaluations. SPi’s auditors utilize QA Navigator, a comprehensive tool designed by TransCom Corp President Judy Hinickle that automates the evaluation process utilizing the Association for Healthcare Documentation Integrity quality standards. In addition to evaluating its own accuracy levels, SPi also takes into account any corrections made by the client after the report was delivered. Involving the client in the audit process is key because it demonstrates the service provider’s willingness to accept responsibility for and correct any errors. But it also prevents misperceptions over the quality of the transcription services provided, which can sometimes be called into question when the end user’s expectations differ from what the contract itself calls for.